A fundamental problem in statistics and learning theory is to test properties of distributions. We show that quantum computers can solve such problems with significant speed-ups. In particular, we give fast quantum algorithms for testing closeness between unknown distributions, testing independence between two distributions, and estimating the Shannon / von Neumann entropy of distributions. The distributions can be either classical or quantum, however our quantum algorithms require coherent quantum access to a process preparing the samples. Our results build on the recent technique of quantum singular value transformation, combined with more standard tricks such as divide-and-conquer. The presented approach is a natural fit for distributional property testing both in the classical and the quantum case, demonstrating the first speed-ups for testing properties of density operators that can be accessed coherently rather than only via sampling; for classical distributions our algorithms significantly improve the precision dependence of some earlier results. Gilyén, A.P, & Li, T. (Tongyang). (2019). 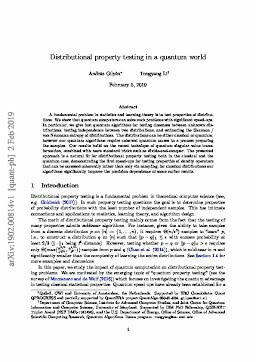 Distributional property testing in a quantum world.